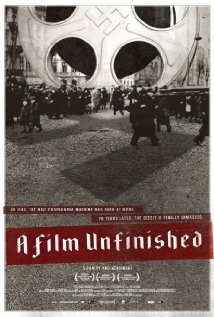 A Film Unfinished (2010) (Hebrew title: שתיקת הארכיון Shtikat haArkhion) is a documentary about an unfinished Nazi film shot in the Warsaw ghetto in May, 1942, two months before its inhabitants were shipped to Treblinka to be murdered. While an edited version of the film (titled, Das Ghetto) has been known since it was discovered at the end of the war, in 1998 East German archivists found an additional reel of outtakes. Israeli director Yael Hersonski uses the newly discovered 30 minutes of film along with interviews with survivors of the ghetto and one of the cameramen who worked on the fim to make sense of the original footage and to raise questions about film as evidence. Where the original Nazi film appeared to show wealthy Jews ignoring beggars and stepping over dead bodies to enter restaurants and clubs, the outtakes show them being forced to participate in staged meals in a fake restaurant for the purpose of the propaganda film. Starving Jews stare at the cameras while a cringing young woman is forced to pose with a beggar. The filmmaker has done a sensitive job of showing us the power of the editor to shape the image we see on the screen, and to influence our understanding of that image. The Nazi film footage creates a certain picture of Jewish life in the ghetto. But we see the outtakes, and we watch survivors as they screen the film and react to it. Their reactions provide both a blunt commentary on the Nazi film itself (“We would have eaten a flower!”) and a sense of the emotions that the actors in the film were forced to cover up. There was a controversy about the marketing of this film. It was given an R rating by the MPAA over the protests of the distributor. It is not as graphic as some of the film footage on display at the Holocaust Museum in Washington DC, and the distributor felt that it did not merit the R. Parents considering watching the film with children should be aware that it contains images of starving people, of brutal behavior, and of dead bodies. Watching this documentary, I was struck by the difference between an image on film and reality. It is said that “a picture is worth a thousand words” but this documentary makes clear that we have to be critical when we look at images. When we see a film, we often feel as if we have been witness to something real, when in fact we have merely been invited to witness the dream of the filmmaker about an event. Jewish tradition is very suspicious of images, and cautious even about the evidence given by a single eye-witness. In that tradition, Hersonski has assembled several different witnesses to testify: several survivors, and the cameraman Willy Wist. Hersonski is herself a witness at a remove: her grandmother was a survivor of the Warsaw ghetto. This is a powerful film that provides insight into many different aspects of the Holocaust. It also raises important questions about the manipulation of perception. The Nazis intended Das Ghetto to be a propaganda film. What was the message they were trying to convey? According to An Unfinished Film, what did the Nazis do to create a film with that message? What had to be cut out of the raw footage? What else had to be done to manipulate the image? What is the difference between a documentary and a propaganda film? How can a critical viewer tell one from the other? Did this documentary leave you with any unanswered questions? This entry was posted in Israel and tagged Anti-Semitism, Documentary, Holocaust, Nazism. Bookmark the permalink.